The Mission Home of The Portugal Porto Mission is lovely home in a very nice neighbothood of the city of Porto, Portugal. The home was built in the 1940´s by a man who imported precious woods. Many of the wooden features of the home reflect his occupation. The Mission Home is located on a street whose name is almost as long on the street itself, Avenida dos Combatentes da Grande Guerra, or The Avenue of the Soldiers of the Great War. 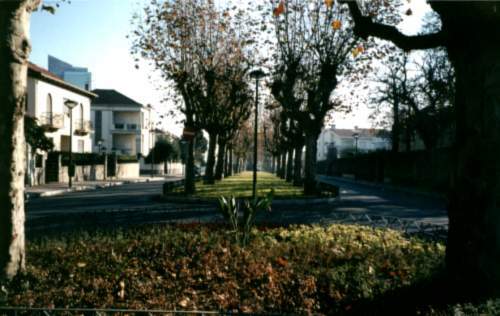 The street is about a quarter mile long with a wonderful center island with trees and gardens. The road and islands were redone in 1997. At that time the cobble stones were replace with asphalt payment and the landscaping of the islands were greatly improved. 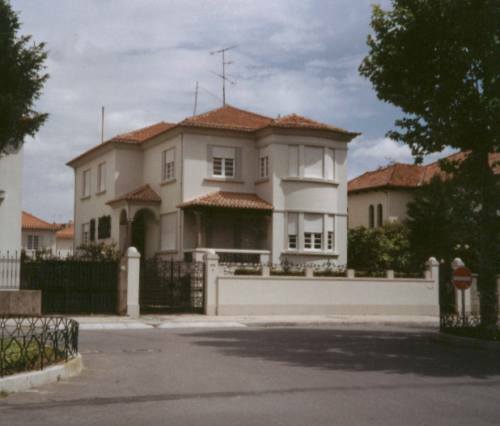 The home was purchased in 1986 for the Church by President Fickland, then president of the Portugal mission. The home was purchased from the family who originally built the home. It is in a wonderful location, two blocks from the mission office, and one block from the Porto 1st and 2nd Wards and the Porto Stake offices. Access to the beltway is just five minutes away. The Mission Home was a very functional facility for the mission. There were seven bathrooms and beds to sleep 18 people. There is a small apartment over the garage that was outfitted for 8 of the 18 beds. Zone Leaders Conferences were held in the large family room located in the basement. This is a view of the Mission Home from across the street. The newly paved road is apparent. The driveway is on the left through the narrow cast iron gate. The entrance gate is on the right. The dining room is in the front on the left. The sitting room is on the right. Upstairs is a bed room on the left and the master bedroom is on the right. The back yard of the mission home is not very large. 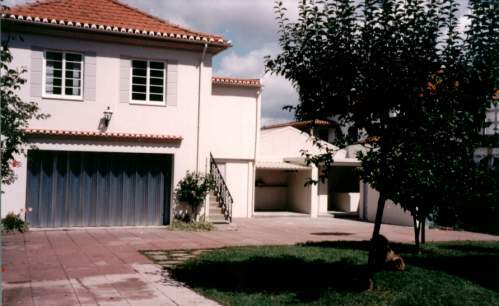 Above the garage is a small, two bedroom apartment where most missionaries spent their first and last night in Portugal. The apartment had three sets of bunk beds and two folding beds. Sisters usually stayed in a bedroom in the mission home. This is a view of the back of the mission home from the steps of the apartment over the garage. The bottom windows on the left are to the guest bedroom where the sisters normally stayed when arriving and leaving. This bedroom was also the "hospital" of the mission, where missionaries stayed to recover. The next set of windows open to the Kitchen. The top level windows open the a bedroom of the family quarters of the mission home. The large windows to the right illuminate the stairs of the mission home. 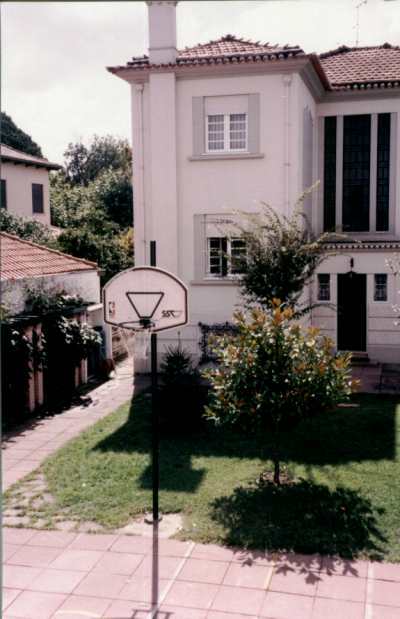 Most large houses in Portugal have such large windows in the stair ways. This is a view out of the kitchen window. It looks out over the back yard. Notice the beautiful flowers along the walls. Since the mission home did not have air conditioning, this window was nearly always open in the summer. This is a view of a sunrise from the master bed room. The master bed was very large and had a small alcove with views in three directions. 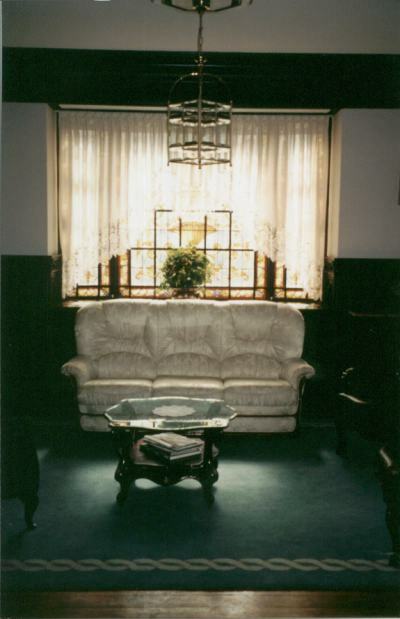 The sitting room in the mission home is beautifully furnished and decorated. The wainscot is carved wood. The dark beams of the ceiling form a lovely pattern. The furniture was very comfortable. In this room missionaries held their first and last testimony meeting of their stay in Portugal. Another view of the sitting room of the mission home. This view includes a view of the stained glass window that provides light to the room. The stained glass dates from the year the house was constructed. Therefore, I assume that it is original to the house. There is an irony in the images of the window. the image of the God of Wine is depicted along with grape motifs. 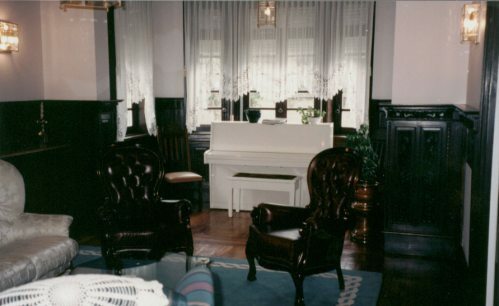 Many pieces of original furniture were purchased with the home. This view shows details of the doors of a piece of furniture of the living room. 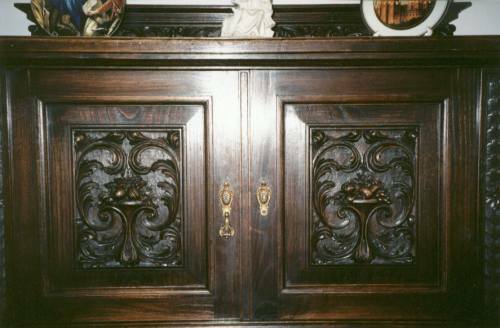 The wood was deeply carved and matched the carved wood in the wainscoat of the room. Click to enlarge When large groups of missionaries had to be fed at the mission home, one of the tables had to be disassembled and moved. 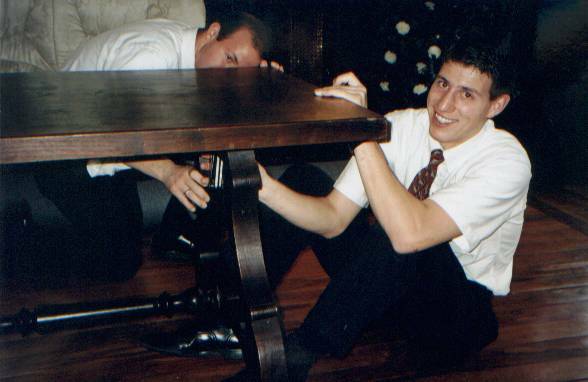 Elder Jonathan Jensen helps with this chore. Notice how thick the wood of the table is. Wood is used sparingly in Portugal. However, large, thick planks of deep, rich woods are common and used for interior furniture and decoration. 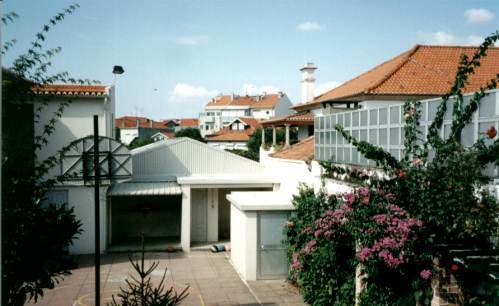 The kitchen was relatively small for a house this size by comparison with homes from the United States.However, for a Portuguese home it was very adequate. Note the marble spash guard in the background. Not only was the spash guard marble but also the counter tops and floors of the kitchen. While beautiful, the marble was very cold in the winter. 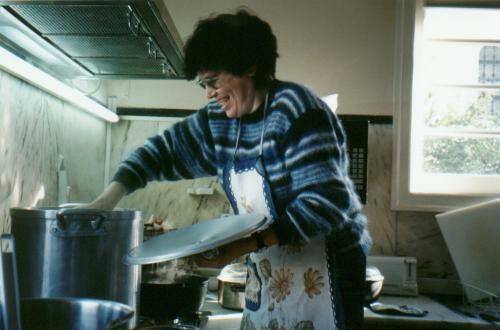 Irmã Freitas regularly helped Sister West prepare meals for the Zone Leader Conferences. It looks like Chili is on the menu for today. Click to enlarge The kitchen was a regular gathering place for the Missionaries as well as the West Family. 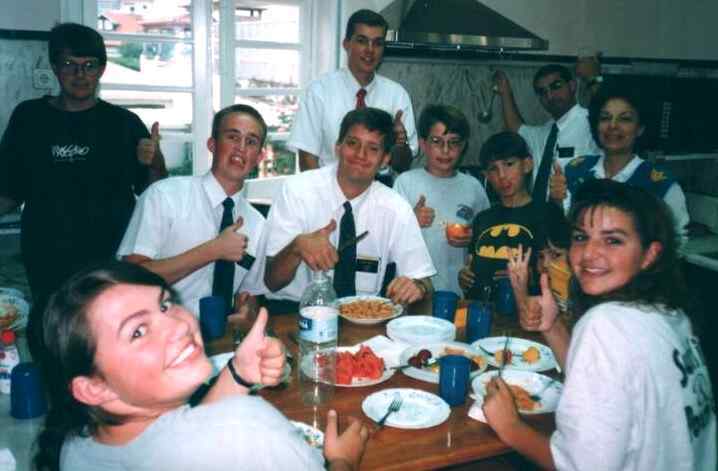 More than once Sister West feed as many missionaries in the kitchen as President West had as Zone Leaders Conferences. Pictured here are Elders Griggs, Gridley, Sullivan, and Aguiar (with the label) who were over to help us enjoy a meal of spaghetti. 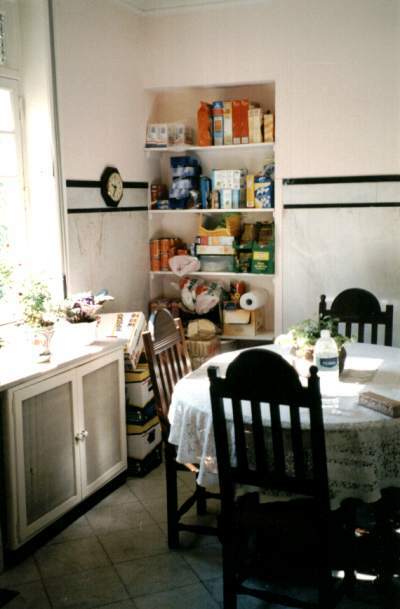 The pantry is one of the lessor rooms in the mission home. However, just about every missionary passed through it on the way to the kitchen from the rest of the house. The room has a small table, some cupboards and the small built in shelf. The room was always bathed in light early in the morning so it is a pleasant room. There are several interesting features of the room that are indicative of the construction of the mission home. Notice the cabinet underneath the window on the left. The radiator for the heating system was located here. The mission home had central heating. However, it was not nearly as effective as Americans are accustomed to. Also, note the marble wainscot along the walls and floor. Click to enlarge No tour of the mission home would be complete without mentioning the West Family dog, Grizzly. Grizzly was a pure native Portuguese breed called Serra de Estrela, named for the highest mountain in Portugual. These dogs were bred to guard sheep and cattle on these high mountains. They were bred to defend livestock against wolves. He had a very heavy coat that would keep him warm in the cold wet, winters of the Portuguese highlands. Weighing in at about 100 pounds with a very loud bark, Grizzly appeared formidable. However, he loved the missionaries and especially small children. You can get an idea of his size from this picture. Jared Miller, a basket ball player nearly 7 feet tall is teasing Grizzly. However, Grizzly was always able to reach the chew toy in Jared's hand. The mission home is located near the Antas Soccer stadium which has very little parking. Thus on game days any available space is used for parking. 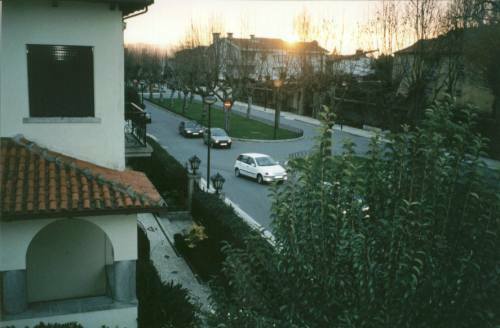 This picture is taken from the front window of the mission home. 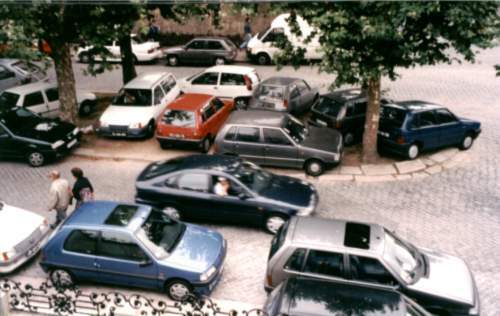 Notice that the cars are parked everywhere, on the island and on the side walk. When the street was repaved parking was no longer allowed on the median islands. Click to enlarge Flowers were always in bloom at the mission home all year round. 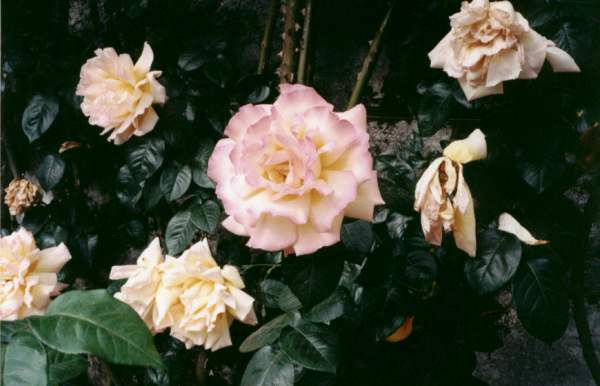 In the summer, the roses along the walls were magnificent. In the fall and winter other bushes burst forth. This is a view down the street in front of the Mission home in the autumn. The Mission Home is on the left and the chapel is two blocks to right. The Mission office is just a little further on the right. One of the most interesting features of Portugal is the juxapostion of the new with the old. There are multimillion dollar homes along the street of the mission home. There is also this house that is really a small rock shack build onto what must be an old rock wall. I do not believe there is running water in this home. 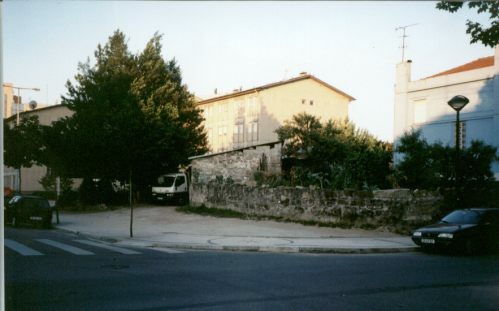 During 1997 the street in front of the Mission Home was replaced. While the cobble stones were replaced with asphalt, the gutters and side walks were made of stone. The gutters were made from large blocks of granite. The approach to the drive way was a beveled stone that required some additional bevels. 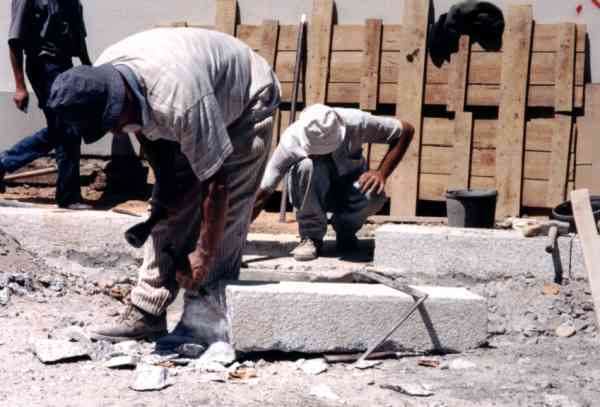 This is a picture of the worker chiseling away at the granite stone. The mission office is just two blocks away from the mission home. 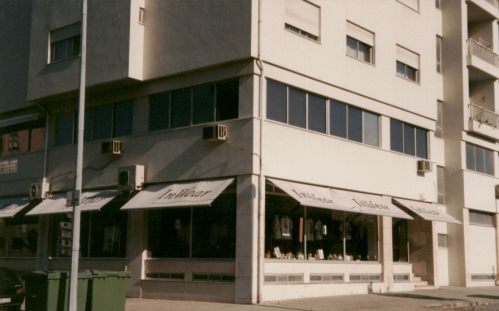 The office is located on the second floor, corner suite. The windows of the president´s office is the second from the left of the corner. The financial secretary was in the corner with the recorder. the Assistants were next on the right. This is a view of the corner area of the mission office. 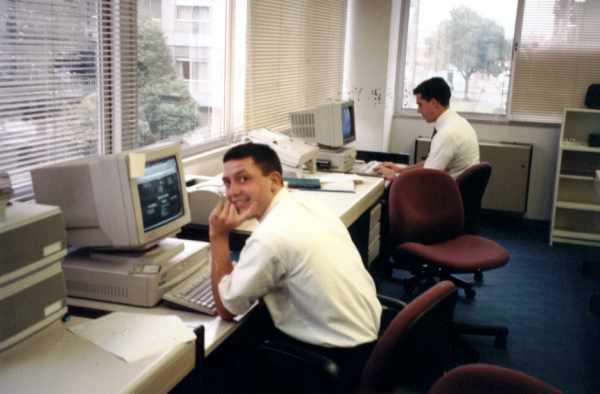 Along the windows were the computers that were shared by the office staff. Elders Spencer and McDonald are busily preparing for a zone conference. Click to enlarge The transfer board was probably the most interesting part of the mission office. The board covered nearly all of one wall of President West´s office. When a transfer was in process and President West was not in the office, a curtain was drawn to cover the "secrets". 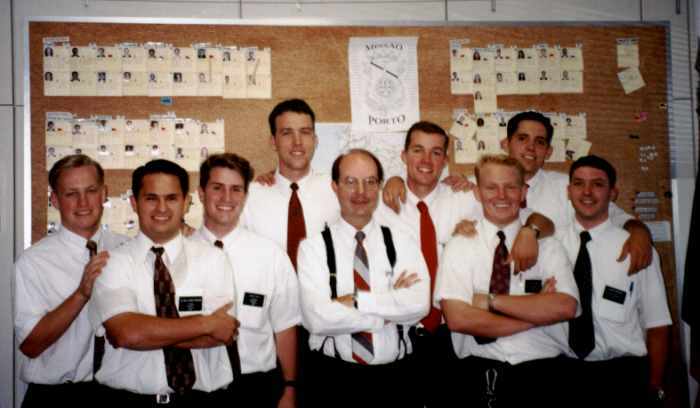 Pictured here is the office staff consisting of Elders Gee, Christensen, Fails, Taylor, Sullivan, Jones, Hales, and Spencer with President West in the middle. This a good view of the financial secretary's corner of the mission office. Later, a number of cabinets were added to the back wall. 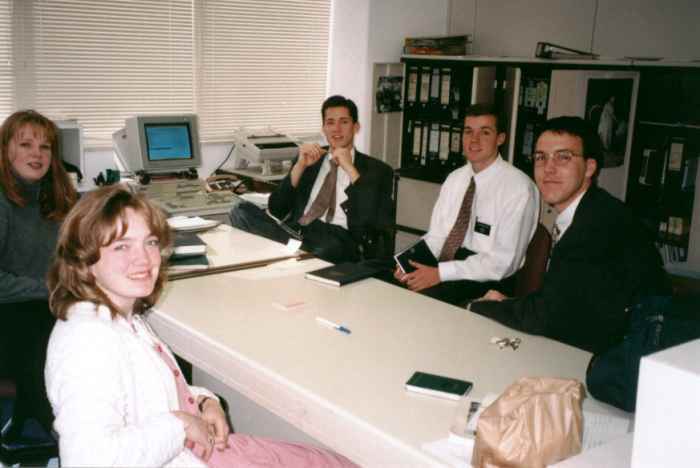 In this picture, Sister Sorensen and Cartwright and Elders Bell, Sullivan, and Taylor are holding a district meeting. © Copyright 2013 Joseph West. All Rights Reserved.